Got some jewelry, a laptop, or a lawn mower laying around the house that you want to keep, but need to temporarily trade in for some quick cash? Are you a first-timer when it comes to doing a pawn and want to understand the costs associated with it before actually moving forward? Well, you’ve come to the right place. 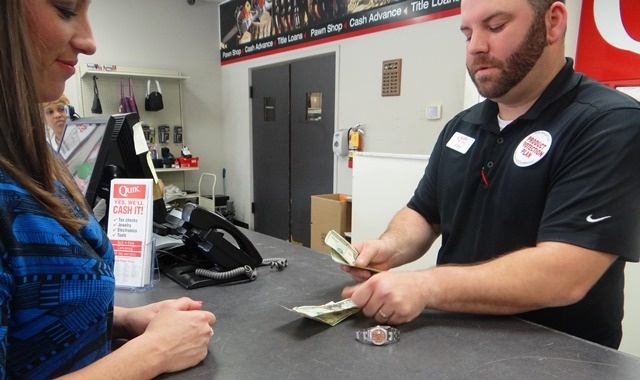 There are many questions first-time pawners have about the process, and this comprehensive list below should answer many of your frequently asked questions. This article will help you weigh the pros and cons and understand how the pawn process works as well as help you calculate just how much this short-term loan could potentially cost you. Well, first thing’s first. If you’re new to pawning, then let’s first start with explaining the differences between pawn loans and traditional loans in order to get a clearer picture of the estimated costs. Pawns are great alternatives to traditional lending options. With traditional loans, the loan is typically approved or denied based on credit history, proof of income, ability to repay, and various other factors. With a pawn, the credit history of the borrowers is not considered since you are using collateral (such as your TV, jewelry, electronics, etc.) in exchange for a loan against the value of the item. Pawns are ideal for people looking to borrow a few hundred dollars or less— although some pawn shops will loan you money on boats, ATVs, and other motor vehicles for larger amounts sometimes up to $15,000. In the case of cars, SUVs or trucks, the title of the vehicle is used as collateral so the borrower will keep their car. Your item can be redeemed usually after a month when the loan amount, including the pawn fee is repaid. The fees at pawn shops can be cost effective in comparison with bank overdraft fees. Borrowers are charged interest on a pawn loan typically between 20-25% per month depending on the loan amount. So if, for example, you were offered $100 to pawn an Xbox One, then when your loan is due in one month, you will be expected to pay $120 ($100 loan + 20% interest fee = $120). If you were to overdraft your bank account by the same amount, you would be charged about $35 in fees regardless of the amount overdrawn. A returned check fee would also cost you a fee around the same amount. The chart below compares the cost of a one month pawn to an overdraft protection fee, which is the most frequently used alternative. In this example the pawn loan is $100 and the fee is 20% a month. Without a pawn, he or she would overdraw their account once during the same 30 days. Typically pawns are due in 30 days, but the loan can be renewed to extend the term for another 30 days by paying only the pawn fees due for the original 30 day term. Pawns that aren’t repaid or renewed within 30 days of the original due date or within 30 days of the due date of any subsequent renewal term will be forfeited. If a pawn is forfeited, the borrower surrenders his or her item to the pawn shop to be placed up for sell and is no longer obligated to repay the loan. Since pawns are considered “non-recourse” loans, a forfeited pawn will not impact your credit score. Note: A bank typically charges a fee of over $35 per overdraft occasion regardless of the amount overdrawn and as many as 6 times a day. With this easy-to-get approach to lending, pawn loans allow borrowers to gain more flexibility to meet their immediate needs should they need a quick leg up. No more damaging your credit in the event that you need money now. Not sure if you have an item that’s “pawn material” or have more questions about the pawning process? Speak to one of our loan officers to get your questions answered over the phone at 1-855-402-PAWN (7296) or click here to find a Quik Pawn near you!